The main goal of Bits & Books is to be a creative, innovative, STEAM education space. We hope for it to be a meeting place where people can discover the latest developments and trends, experience and share knowledge, and develop projects related to the world of electronics, robotics, programming and digital manufacturing, within a framework of creative and artistic freedom, inspired by the roots of maker culture. Bits & Books is physically connected, by an interior hallway, with LHA, one of the most important technical libraries of Barcelona, with a history spanning over 70 years, and associated with Marcombo publishing, which brings a great creative and business potential, establishing amazing synergies within the holding. Bits & Books is a street level space stretching 100m2, located in the center of Barcelona, at University Square, right in front of the headquarters of the University of Barcelona and a 5 minute walk from Catalunya Square and the Ramblas. 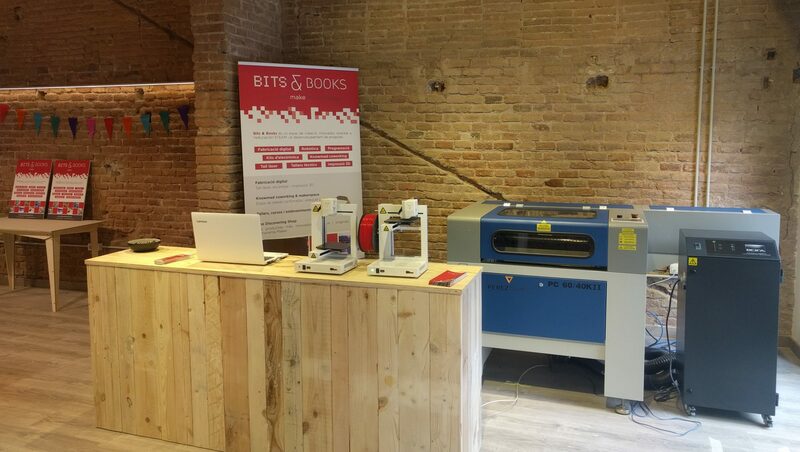 This convenient and easily-accessible location gives Bits & Books a perfect location for the development of all kinds of activities related to creating, innovating, educating and digital manufacturing.